Milk teeth start falling out from about the age of five. First, wobbly front teeth – upper and lower incisors. Kids usually love. They are happy that they will soon become adults. To the tooth takes about weeks. Someone who shakes and pulls it alone, and some need help from their parents. Some of the children it drops out a few teeth, and others it may take years. Some first-graders can boast of two or three molars, and sometimes it happens that in eight years the milk teeth are just starting to wobble. Especially individually. Wobbly teeth take child a lot of inconvenience. Such a tooth be sure to remove, but often children can't do it alone, afraid of pain and blood. Reassure your son or daughter. Tell me that the tooth is old. he never rests only on the thin film. Just one sudden movement and it will not, you put the tooth in a box or "give a mouse". If the child is afraid, ask him to trust you, because you are an adult and know everything. You had milk teeth, and they're staggered and fell. Ask the child to lie down on your lap, put your head and open your mouth. Grasp the tooth with your fingers. Sharply pull. Listen to your child. If he says he's in pain, requires you to stop, then stop. Otherwise, he will always be afraid of dentists. Try to tie a string around a loose tooth and pull it. You can also attach this thread to the doorknob and abruptly close the door. 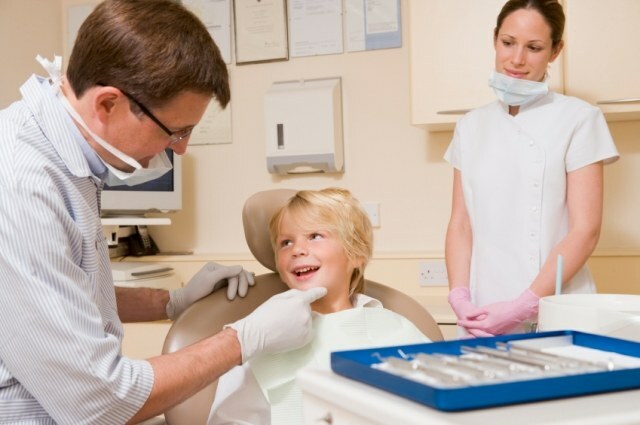 Contact your dentist at children's dental clinic. Modern private clinic with all the necessary in order to make the removal and dental treatment as painless as possible. Near dental chairs at the children's eye level monitors are installed, which show the cartoons. Perhaps your child will not even notice that the doctor removed his loose tooth, it's a matter of two seconds. Now dentists use laughing gas during the treatment manipulation. The child wears a mask for a few seconds, through which is fed a special formula. It has a sedative effect, suppresses the feeling of fear and pain. Don't do anything if the child is afraid. The time will come and the tooth to fall out himself. In any case, it will push a native.